The Cañon City Area is steeped with geological significance. From scenic drives and hikes to mining camps and resorts, so much of Cañon City has been shaped by the mountains that fill its horizon, rivers that snake through its soil, and rocks that hold secrets to our past. The tunnels on Tunnel Drive were first blasted out of rock in 1892 as part of an irrigation project. In 1908, under Warden Cleghorn’s direction, the tunnels were enlarged for horse and buggies using 26 convicts as laborers. The longest tunnel is 400 feet long, while the other two are 100 feet long. Automobiles were allowed to travel through these. The tunnels were closed in 1990 for fifteen years. No longer a car route, the 2-mile long Tunnel Drive Trail is now a popular hiking destination. Built by inmate labor in 1905, Skyline Drive was noticed by early settlers in 1860. Stretching two and one-half miles above the distinctive Dakota Sandstone hogbacks, this is now a one-way road. Dinosaur tracks were discovered here in 2001, while many layers of the earth’s geological history can also be seen. Noted geologist and paleontologist, Charles Doolittle Walcott, conducted research at the Harding Sandstone Quarry in 1890 and 1892. He named and described the Harding Sandstone Formation and the Fremont Limestone Formation found at the foot of Fremont Peak, claiming they were from the Ordovician Period (450 million years old). In 1892, he named and described Astraspis desiderata (a primitive jawless fish), the world’s oldest known vertebrate fossil until older species were found in 1977. Walcott was the third Director of the US Geological Survey and Secretary of the Smithsonian Institution until his death in 1927. The western tower of the Old Max Prison Complex is the location of what was Soda Springs, or “Bell’s Springs” after Captain John Bell of the 1820’s Long Expedition. In the 1870s, citizens built a pavilion over the stone basin of Soda Springs, and in 1950, the springs were destroyed during the construction of Highway 50. Many people, from the earliest native groups to Zebulon Pike, used the bubbling waters of Cañon City’s hot springs. In 1873, development of the land for commercial use began. The first hot springs bath house was in business in 1878, and in the early 1880’s, the Hot Springs Resort was built complete with a bridge over the Arkansas. Over the next several decades, various owners ran the establishment. In 1948, the pool building was destroyed, and in 1950, the building was torn down. This road was built in 1911 to make it easier for folks to get to the Royal Gorge. Although its scenery was breathtaking, its steep grade made it very difficult for cars. At the top of the road were a lodge, a restaurant, and a dance hall owned by the Reel California Girls, which unfortunately burned down in the 1920’s. 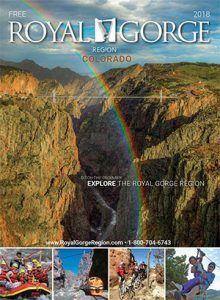 In the late 1870’s, the Denver & Rio Grande Railroad, owned by General William Jackson Palmer, and the Atchison, Topeka, & Santa Fe Railroad were fighting a “war” to build competing rail lines through the narrow confines of the Royal Gorge. Throughout the canyon were “forts” named after James R. DeRemer, a Denver & Rio Grande Railroad employee whose method of warfare was rolling boulders onto the Santa Fe workers. The war was resolved in 1880 by the courts and a $1,400,000 payment to Santa Fe for the tracks laid was issued. By September 1880, the then narrow gauge tracks reached Fremont Pass near Leadville. Named for the grapevines growing throughout the canyon, Grape Creek Road follows the Ute trails. In 1807, Zebulon Pike followed this route, going through the Wet Mountain Valley and over Medano Pass to the Rio Grande River, which he thought was the Red River. In 1880’s, the 36-mile Denver & Rio Grande Railroad Grape Creek Line went through the towns of Dora City, Titusville, and Blackburn (now long gone) to Silver Cliff. While building the railroad in 1881, workers discovered this natural amphitheater-like cave that measures 100 feet across and 50 feet deep. Once a popular picnic site in the 1890’s, there is no longer a bridge to cross Grape Creek. One local legend suggests that a beautiful Lachita Indian maiden met her death in Temple Canyon when two warriors from different tribes battled over her. Platted in 1888 and incorporated in 1913, Brookside began as a coal camp, whose mine was located next to a babbling brook, thus the name Brookside. At its height, there were two schools, a barber shop, five saloons and a Santa Fe Railroad Depot. In the late 1880’s, Brookside became the county’s resort community, offering seven saloons, ladies of the evening, and gambling. In 1911, one of the most famous saloons, the Old Fremont Saloon, was a favorite of silent movie star, Tom Mix. 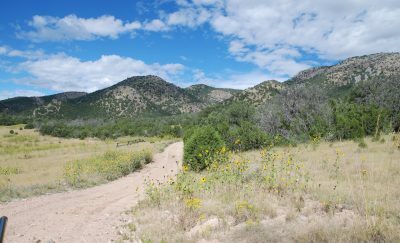 Named after late President Lincoln, 1,700-acre Lincoln Park was platted southeast of Cañon City by Captain B. F. Rockafellow, who was involved in several endeavors from mining to real estate. Later, William Dallas “Dal” DeWeese established a nursery specializing in fruit trees and successfully irrigated over 10,000 acres of Lincoln Park. DeWeese advertised in the newspapers that he had 200,000 fruit trees, 500,000 shade trees, and 300,000 shrubs for sale. In 1886, he re-platted Lincoln Park and sold land parcels to over 200 families. Original irrigation came from Grape Creek, and in 1896, the De Weese Reservoir was established near Westcliffe southwest of Cañon City in Custer County. In 1905, Florijan Adamic, an Austrian-born miner, platted Prospect Heights, one of the smallest incorporated towns in Colorado. The town’s fame came from its 24-hour saloons, which flourished after Cañon City voted to ban liquor sales in 1905. It is also said that Tom Mix, an American silent-film actor and the star of many early Western movies, frequented the Prospect Heights bars and occasionally ended up in the jail, which still stands today. 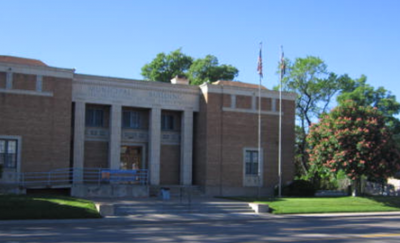 Now owned by the Fremont County Historical Society, the jail is open for tours on Saturday afternoons from May through mid-October. Built in 1902 and operated by the New Jersey Zinc Company, the Empire Zinc Smelter treated large amounts of zinc-iron middlings from Leadville, employed up to 400 workers, and was shut down in 1968. Begun by the Cañon City Coal Company in 1883, the Nonac Mine was later owned by the Colorado Fuel & Iron Company (CF&I). As one of many area coal mines, it employed about 90 men and produced 300 tons of coal per day prior to its closure in 1907. The Western Fuel Company platted the town of Chandler in August 1890. Considered the prettiest of all the Colorado coal camps, the town included a general store, school, boarding house, and saloon. The town was neatly kept and had tree-lined streets. The coal mine produced second only to Rockvale. In 1904, trouble came to Chandler, as with other coal mines, such as Ludlow. By 1942, the coal pits closed, and in 1944, its train tracks were lifted and its buildings were either moved or torn down. Platted in June 1899 for Greenhorn Mining Company, Dawson began as a tent city in the lower reaches of Grape Creek with a few makeshift cabins and a population of 500 gold miners. Unfortunately, the gold claim was minor and the rush soon died. In 1870, Ernest W. Sell developed a resort after a flood channel created a three-acre lake perfect for picnics, swimming, and boating. By 1914, there were 80 acres of green fields and fruit trees near Ninth Street and Sell Avenue. The resort offered a bandstand and picnic area and chaperoned dances were held on the dance floor through the 1920’s, while ice-skating on the lake continued from 1932 to 1940. North of Cañon City and along County Road 9, are historic quarries where the fossilized remains of dinosaurs were discovered in the late 1870’s. The fossils are now on display in the Carnegie Museum, Peabody Museum, Denver Museum of Natural History, and others. Fremont County’s Garden Park School, located approximately ten miles north of Cañon City along Garden Park Road, was added to the Colorado Register of Historic Properties in November 2008. The 1895 school served as the educational center for the children of local ranching families until consolidation closed it in 1961. As the only public building on the landscape for miles, it also served as an important place for social gatherings such as dances, Sunday school, and theater productions. Architecturally, the school displays the distinctive characteristics of a typical schoolhouse building of the time. Built using local labor and native materials, it has a rectangular plan, front gabled roof, tall narrow windows on each side, and a single classroom. A stucco application in 1916 and 1917 was a typical treatment for adobe, which was susceptible to deterioration. A few miles past the Garden Park School is the 600-acre Red Canyon Park, one of several parks acquired for the area from the Federal Government by Congressman and former Cañon City Daily Record Editor, Guy U. Hardy. Comprised of dramatic red sandstone formations, sheer cliffs, and Pinyon, Sage, Junipers and Spruce, Pike passed through this area in 1806 expedition.